I have already finished my two sessions and I already learned the freestyle and breaststroke. I still have one lesson left. I am really excited for what I am going to learn next. Pretty amazing, huh? LOL! I am so proud of myself. After what I’ve been through last year and now I can swim already. Thank God for the amazing recovery! How about you, what activities are you in this summer? Congratulations! I think it’s a great achievement to learn ow to swim. I never learn how to swim. I’m even planning to anymore..hehe.. Enjoy summer! Congrats! Swimming is my PE lesson when I was in college but I did not really learn, I can do freestyle only pero di pd sa malalim. hehehe! 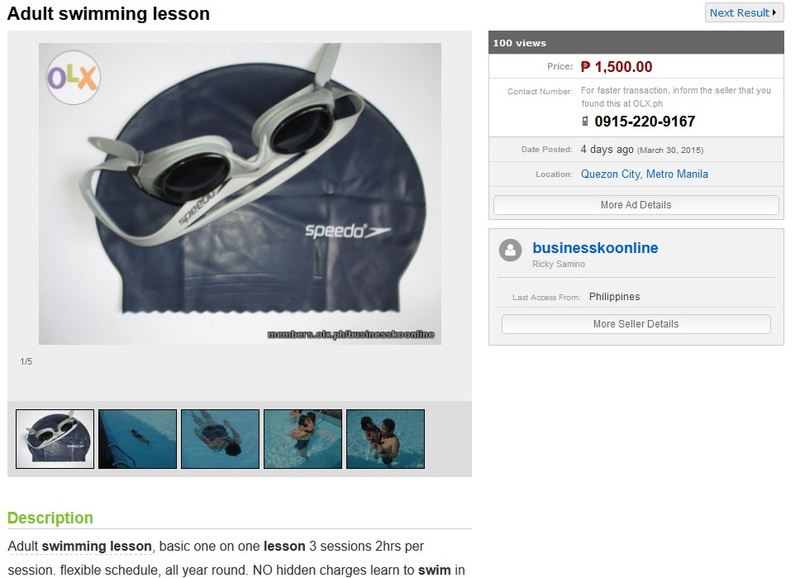 Pingback: Swimming Lesson Marikina Area Part Two | Forget the drama! Yay for taking up swimming! It’s one of my favoritest things to do, if only I could swim everyday, I would! But I still do want to take formal lessons because I am only winging it, I’m sure I’m not doing the strokes right. hehe. We have a public pool nearby but they are closed at night. I really should explore using it on a regular basis. Great to read that you are learning swimming. It certainly is a great skill to learn for life. I always wanted to learn how to swim yet I am afraid of testing the water depth, hehe. Anyway, I am busy with work still this summer. But if we have time I wanted to bring my entire family to the beach. that is a refreshing way to learn something new during summer. 🙂 money and time well spent if i may add. I love to swim even if I am bad at it. I was so bad my coach laughed at the way I swam, saying my arms look like chicken wings. Two thumbs up for swimming lesson Sis. I enroll my daughter for dance class and swimming lesson afterwards. Can’t swim so I might need this swimming lesson badly. Good job on attending your swimming lessons! Good job! Your coach is very good then, and highly recommendable? I also have something in my mind to do this summer, but I don’t really know yet how it will go. Fingers crossed. Congratulations! I have yet to learn how to swim! I am still scared of the water. I also want to learn but it’s hard to find a trainer here in Pampanga. Is the P1500 fee good for all three session? Or one session only? Thanks! I miss our swimming classes back in college. It’s nice to know you’re enjoying your lessons! Congratulations! Learning how to swim is very important, not only for leisure, but a necessary skill needed especially for emergency cases. I learned how to swim back in Elementary. Our school has a swimming pool, so swimming is always part of physical education. Now, the school where my kids attends doesn’t have one. So I am planning to send them to swimming lessons this summer or next. I would love to swim ! I miss swimming. Miss doing laps. I wanted to learn how to swim too, maybe next summer I’ll try it together with husband and the kids. Oh! Thanks for this info. I had summer outing in the beach but do not know how to swim. So, I was not able to enjoy it. That is why I am searching for a swimming lesson for adults and I found this. Meron pa bang nakaschedule na swimming lesson ngayon?